When Stephanie Staal first read The Feminine Mystique in college, she found it “a mildly interesting relic from another era.” But more than a decade later, as a married stay-at-home mom in the suburbs, Staal rediscovered Betty Friedan’s classic work—and was surprised how much she identified with the laments and misgivings of 1950s housewives. She set out on a quest: to reenroll at Barnard and re-read the great books she had first encountered as an undergrad. From the banishment of Eve to Judith Butler’s Gender Trouble, Staal explores the significance of each of these classic tales by and of women, highlighting the relevance these ideas still have today. This process leads Staal to find the self she thought she had lost—curious and ambitious, zany and critical—and inspires new understandings of her relationships with her husband, her mother, and her daughter. Stephanie Staal is a former features reporter for the Newark Star-Ledger, and has written for Cosmopolitan, Glamour, Self, and the Washington Post. She is the author of The Love They Lost, a journalistic memoir about the long-term effects of parental divorce. A graduate of Barnard College and Columbia University’s Graduate School of Journalism, she now lives in Brooklyn, New York. 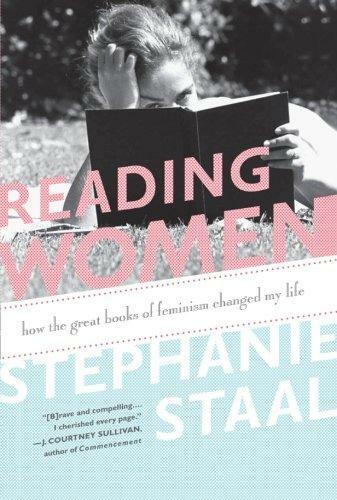 What did you think of the author’s decision to return to Barnard and take Feminist Texts? If you could go back to college and re-take one course, which one would it be? Have you read any of the books from the Fem Texts syllabus? Which one has made a mark on your life? Staal writes a lot about the work/mother dichotomy, and how difficult it is for women everywhere to inhabit these roles fully simultaneously. If you are a parent, how have you handled this situation? The class encounters different types of feminists throughout the course of their readings—from the radical feminists like Shulamith Firestone to the “post-feminists” like Katie Roiphe. How do you define a feminist? Do you consider yourself a feminist? If you do consider yourself a feminist, can you attribute it to a particular event or experience in your life? The last text Staal reads for her class is a blog called “Baghdad Burning.” What non-canonical texts—whether it be fiction, non-fiction, poetry, blog, book, magazine or other types of writing—have contributed most to your understanding of feminism? Staal observes many differences between opinions she espoused while in college and those of her Gen Y classmates. How do you think the younger generation, raised in the social network/ Facebook era, will respond differently to the challenges of reconciling adulthood or motherhood with feminism? Will it be any easier for them than it was for the author’s generation? Staal is upset by the New York Times article about Ivy League women opting out of the workforce “not so much because these young women wanted to be stay-at-home mothers, but for their seeming readiness, at nineteen years old, to resort to traditional gender roles without a peep.” What do you think of that article? Of Staal’s opinion? Of all of the books the author writes about, which one intrigued you the most? Which author was the most interesting to you?